Around 15 species; see list of cetaceans or below. 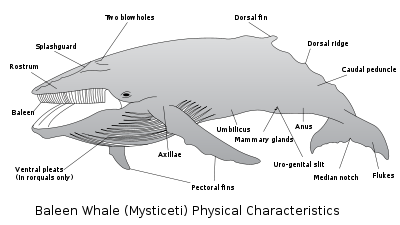 Baleen whales comprise the Mysticeti, one of two suborders of the mammalian order Cetacea, the other suborder being the Odontoceti, or toothed whales (dolphins, porpoises, and various whales). Baleen whales are characterized by having baleen plates for filtering food from water, rather than having teeth. They also differ from toothed whales in that they have two blowholes rather than one. Baleen whales also are known as whalebone whales or great whales. Baleen whales are the largest whales, and include the world's largest animal, the blue whale (Balaenoptera musculus). Filter feeders, they are generally seen as gentle animals, a sighting of which adds to the wonder of nature for humans. Their grace, intelligence, and massive size has led to their being celebrated in art, music, and literature. Yet, they have also been hunted excessively and have greatly declined. For example, blue whales were abundant in nearly all oceans until the beginning of the twentieth century, but over the course of forty years, were hunted nearly to extinction. Pressures continued to harvest whales even when the numbers were severely declined, but the human responsibility to better understand and conserve these animals had led to various protective measures by the late twentieth century. The suborder Mysticeti contains four families and fourteen or fifteen species. The scientific name derives from the Greek word mystax, which means "mustache." Whales are members of the order Cetacea, which also includes dolphins and porpoises. Whales are the largest mammals, the largest vertebrates, and the largest known animals in the world. Like all mammals, whales breathe air into lungs, are warm-blooded, breast-feed their young, and have hair (although very little). Unlike fish, which breathe air using gills, whales breathe air through blowholes that lead into their lungs. The baleen whales (Mysticeti) are characterized by baleen, a sieve-like structure in the upper jaw made of the tough, structural protein keratin. 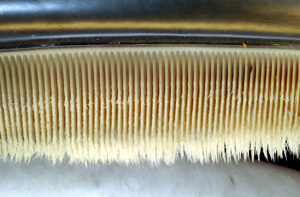 The baleen is used to filter plankton from the water. Baleen whales are also characterized by two blowholes. The toothed whales (Odontoceti) have teeth and prey on fish, squid, marine mammals, and so forth. This suborder includes dolphins and porpoises as well as whales. An outstanding ability of this group is to sense their surrounding environment through echolocation. Toothed whales have only one blowhole. In addition to numerous species of dolphins and porpoises, this suborder includes the Beluga whale and the sperm whale, which may be the largest toothed animals to ever inhabit Earth. Living Mysticeti species have teeth only during the embryonal phase. Fossil Mysticeti had teeth before baleen evolved. Baleen whales are generally larger than toothed whales, and females are larger than males. This group comprises the largest living known animal species, the blue whale. As in all whales, the body is fusiform, resembling the streamlined form of a fish. The forelimbs, also called flippers, are paddle-shaped. The end of the tail holds the fluke, or tail fins, which provide propulsion by vertical movement. Although whales generally do not possess hind limbs, baleen whales sometimes have rudimentary hind limbs; some even with feet and digits. Most species of whale bear a fin on their backs known as a dorsal fin. Beneath the skin lies a layer of fat, the blubber. It serves as an energy reservoir and also as insulation. Whales have a four-chambered heart. The neck vertebrae are fused in most whales, which provides stability during swimming but at the expense of flexibility. Baleen whales have two blowholes, causing a V-shaped blow. 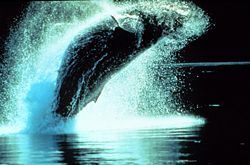 The shapes of whales' spouts when exhaling from the blowholes after a dive, when seen from the right angle, differ between species. Whales have a unique respiratory system that lets them stay underwater for long periods of time without taking in oxygen. In spite of their enormous mass, baleen whales are able to leap completely out of the water. Particularly known for their acrobatics are the humpback whales, but other baleen whales also break through the water surface with their body or beat it loudly with their fins. The reason for these habits is not known for certain. In contrast to toothed whales, baleen whales are unlikely to echo-locate. Instead, they are able to produce high volume sounds in the infrasonic range. The calls of the largest whales can be heard several hundred kilometers away. Unique are the songs of the humpback whales, consisting of complex sequences that may slowly evolve over years. They are probably used for courting. From the eleventh to the late twentieth centuries, baleen whales were hunted commercially for their oil and baleen. Their oil can be made into margarine and cooking oils. Baleen was used to stiffen corsets, as parasol ribs, and to crease paper. The extant families of baleen whales include the Balaenopteridae (humpback whales, fin whales, Sei Whale, and others), the Balaenidae (right and bowhead whales), the Eschrichtiidae (gray whale), and the Neobalaenidae (pygmy right whales). The Balaenopteridae family (rorquals) also includes the blue whale, the world's largest animal, and perhaps the largest animal ever to exist on Earth. It reaches 30 meters (93 feet) long and can weigh up to 180 tons. The classification here closely follows Rice's Marine Mammals of the World: Systematics and Distribution (1998), which has become the standard taxonomy reference in the field. There is close agreement between this classification and that of Mammal Species of the World: 3rd Edition (Wilson and Reeder 2005). Any differences are noted using the abbreviations "Rice" and "MSW3" respectively. Further differences due to recent discoveries are also noted. Early baleen whales first appeared as far back as the Early Oligocene, or perhaps the latest Eocene (39-29 million years ago). Early baleen whales did not have (or had very little) baleen, and still had teeth obtained from their ancestors. Among them was Janjucetus, a baleen whale with sharp teeth that hunted fish, squid, large prey such as sharks, and probably dolphin-like cetaceans. This hints that early baleen whales were predatory and eventually evolved into the gentler, toothless whales known today. The first toothless baleen whales probably appeared in the Early or Middle Miocene, from a toothed ancestor that adapted from eating small fish or other creatures to, eventually, feed by filtering. Mead, J. G., and R. L. Brownell. 2005. Order Cetacea. In D. E. Wilson and D. M. Reeder, eds., Mammal Species of the World, 3rd edition. Johns Hopkins University Press. Pp. 723-743. ISBN 0801882214. Wilson, D. E., and D. M. Reeder. 2005. Mammal Species of the World, 3rd edition. Johns Hopkins University Press. ISBN 0801882214. Whale and Dolphin Conservation (WDC). This page was last modified on 9 May 2016, at 18:41.